Travelers are sick of being crammed into airplanes with little space for their carry-on luggage. That's the passenger feedback Airbus said it considered when designing its newest cabin, which will make its debut on planes next year. The new interior, called Airspace by Airbus, will have more floor space, bigger luggage bins and updated bathrooms. Airspace will be standard on the new A330neo and the A350 XWB. The aircraft's economy seats will be its standard 18-inches wide, which is an inch larger than the competition, Airbus touted. The cabin offers entertainment systems with larger seat-back screens and no longer has under-seat control boxes, freeing up floor space. The lighting in the cabin can be changed to reflect the time of day. Overhead bins will fit five suitcases. The industry have been working to design cabins that fit more passengers without compromising personal space -- a top complaint from fliers. The new cabin is able to fit 14 more seats on the A330neo, but the company said it has more floorspace due to design changes to the bathrooms and crew area. Airlines could choose to maximize seat rows, or put in fewer seats to offer more room. 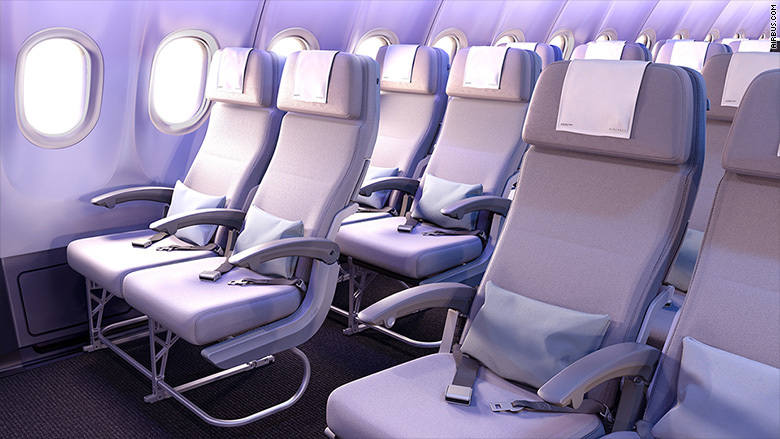 Economy seats in the new Airspace by Airbus are 18 inches wide. 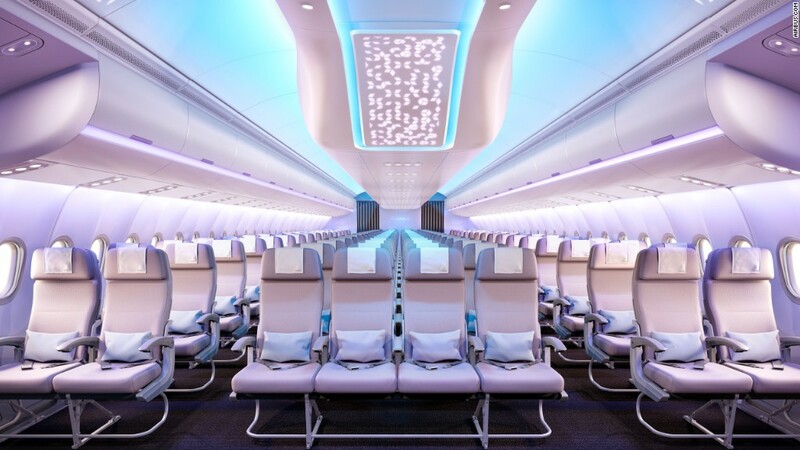 Airspace cabins will have customizable lighting and also have more luggage room. The overhead bins will be able to hold 66% more volume and fit five suitcases. The bathrooms in the cabin are also getting a hygienic upgrade with touchless faucets and flushing, aroma dispensers and antibacterial surfaces. The fight to stop airplane seats from shrinking has reached Capitol Hill, with lawmakers calling on the Federal Aviation Administration to create a minimum seat size and distance between rows.